Folks, it is time I admit it: I am a J.R.R. Tolkien fan. And not just the Peter Jackson, wait at midnight for the next iteration of The Hobbit kind of a fan. No, I’m more of the “attend Jackson’s Lord of the Rings movies for the first time, and whisper the lines five seconds before the characters say them” type of fan. I’m the fan that considers The Silmarillion a ‘must have’ reference book; the fan who read the appendices that follow Book VI of the Return of the King; a fan since the ’70s. I only share this nugget because lately Galadriel’s choice to diminish, rather than becoming the next iteration of a dark and powerful ruler, has been weighing on me. When is it the right time to diminish, to let go of that next professional journey, to say my life has been well-lived, and then to diminish? Although our counter-choices are not as all-consuming and evil as Galadriel’s opportunity to depose the Dark Lord, they are still risky and frightening. Should we pursue our next great dreams? Or is it better to turn away and take the safe, secure passage into our future. This choice between security and adventure presents itself throughout our lives. When we are young, we make adventurous choices effortlessly. We fall in love, take a new job, marry, have children, fight for promotions. But somewhere along the line, some let fear slow us down. Our ‘what-ifs’ no longer lead us to green meadows, wonder and awe. Instead our what-ifs become negative and self-defeating: what if I don’t have what it takes? What if something bad happens. Operating from fear, we find it easier to diminish than to step into our next great adventure. These are the things I have been thinking about. I am no longer the youth rushing headlong into adventure. I count the years that remain. If I want to change my life’s course, pursue a new mission, or reach long-held goals, then I must act now and that involves risk. If I choose to diminish, then there are gardens to tend, words to write, friends to meet, and family to love. Risk and security: both seductively attractive. 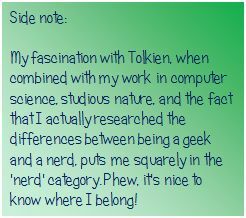 This entry was posted in Self Confidence, Weekly Brief and tagged Diminish, Fear, Galadriel, Lord of the Rings, Risk, Security, Tolkien. Bookmark the permalink.